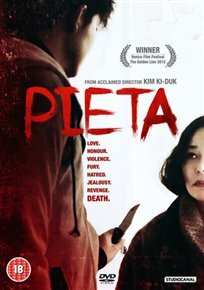 South Korean drama about a brutal debt collector who seeks redemption from a woman claiming to be his long-lost mother. While working for ruthless loan sharks as an enforcer, Kang-do (Jeong-jin Lee) has built up a feared reputation amongst the debtors he threatens. When out of the blue he receives a visit from a middle-aged woman (Min-soo Jo) claiming to be the mother who abandoned him years previously, the coldly emotionless Kang-do angrily refutes her story. But over the coming weeks, as the woman stubbornly refuses to back down, a growing relationship develops between the two, causing Kang-do to question the life he has chosen.